An early start for us this morning departing Stone just after 8.00am. The forecast weather in the afternoon wasn’t that promising so we decided to move before the sunshine turned liquid. Just below Stone is a sight that will bring a tear to an Aussie boaters eye. 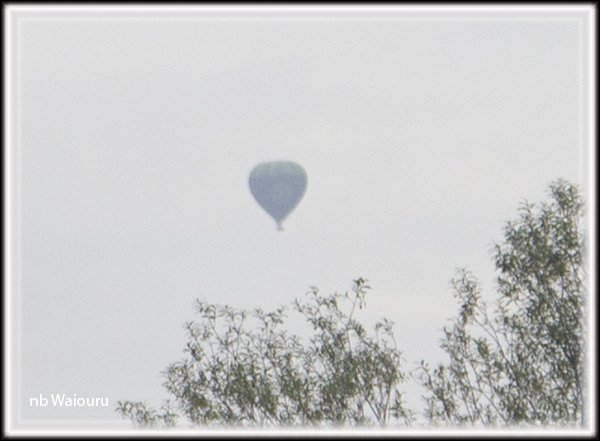 Shortly afterwards we noticed a hot air balloon in the morning mist above the horizon. Most hot air balloons go up in the early morning when the air is colder and dense. We actually noticed one in the same general area when we went this way last summer. Can you see it in the photo above? Try the next photo. Still can’t see it? I’ll zoom in….. Youngest son wanted us to go up in one when we were travelling together in Turkey. There’s no way I’m going up in something that relies on hot air. Too many of them crash for my liking. 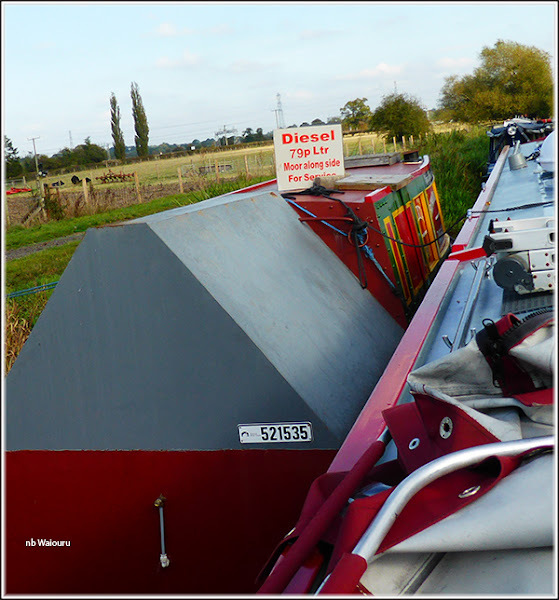 On reaching Sandon Lock we found a queue of four boats waiting to go down. It seemed a most unusual situation for this time of year. Our spell of good luck must have ended because we were the last boat in the queue. The boat ahead of us was owned by a couple from Perth, Western Australia. They spend the summer in the UK and then return to Perth for a second summer. 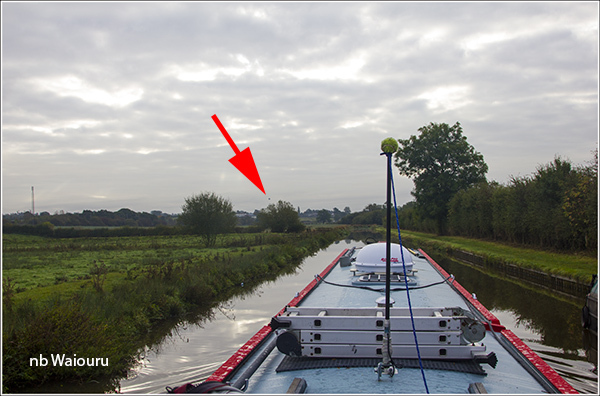 Between Sandon and Weston Locks we passed a boat with a familiar name going in the opposite direction. 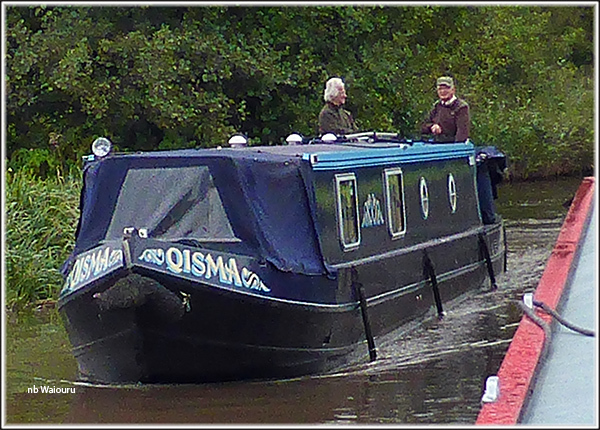 Who would have thought there were two boats named QISMA. What will Jan & Alastair make of it? Just before Hoon Mill Lock there was a large pigeon eating beside the canal. 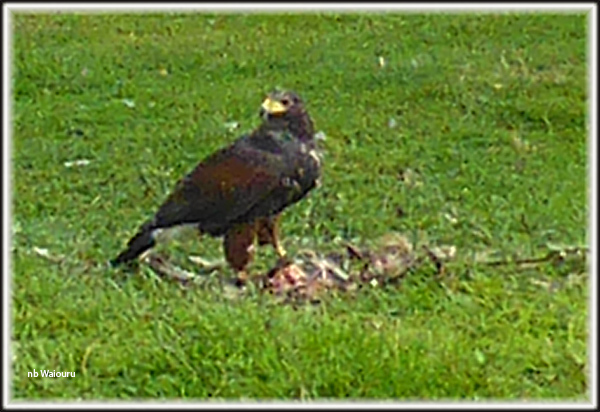 It was suggested this is a bird of prey but it looks too darned small to me. An Australia Wedgetail Eagle has a six foot wingspan. We stopped at Great Haywood Junction to top up the water tank before continuing on towards Rugeley. Three years ago I was corrected by a local when I pronounced it was Rug(carpet)eley rather than Roogeley. 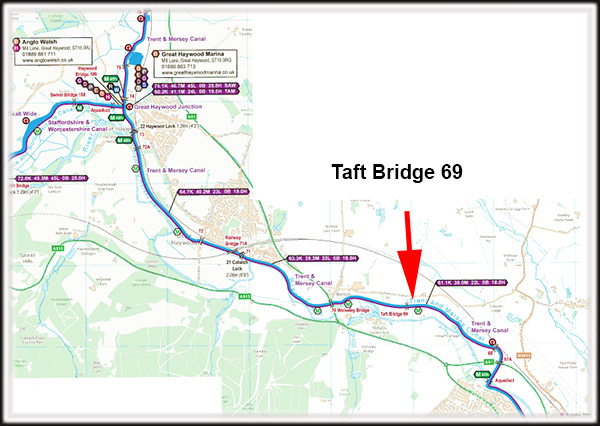 We had an ulterior motive for continuing on, wanting to reach the fuel boat at Taft Bridge. 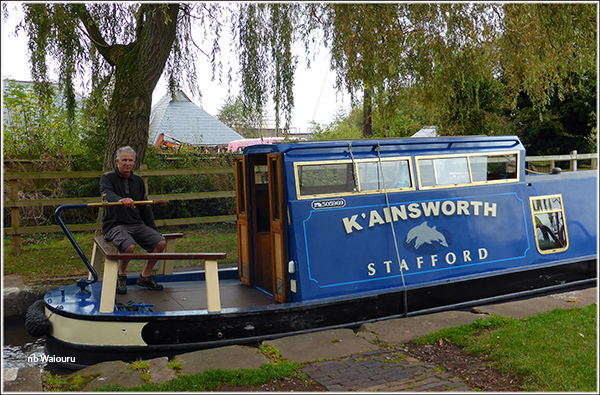 The last time we filled the main diesel tank was at Wheaton Ashton when we commenced our summer cruising. 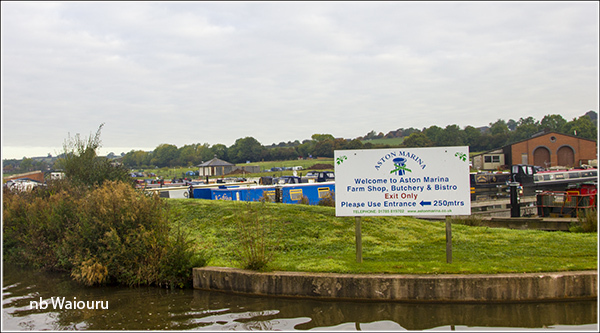 Another 60 litres were added at Portland Basin Marina as a safety measure last month. When we filled the tank today it took 214 litres so adding the 60 litres earlier wasn’t really necessary. We would have made it without having to add diesel. 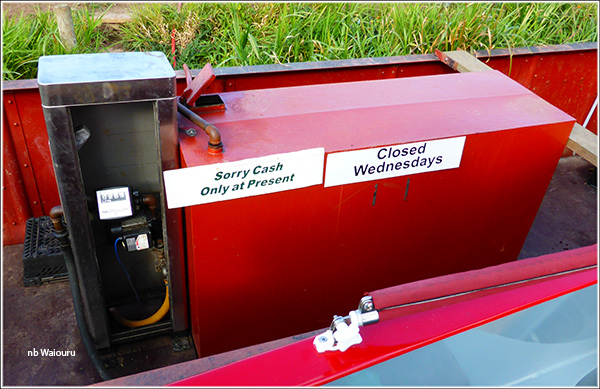 The fuel boat is permanently moored adjacent to the pig and poultry farm (free range eggs also for sale). The diesel tank on the boat didn’t look all that large and I was concerned they may not have sufficient fuel to fill our tanks. The male dispensing the fuel had dragged a long orange coloured air hose with him which went all the way back to the farm. I assumed the fuel bowser was powered by compressed air (supplied by the orange hose). In the above photo you can see the hose in the grass and will note it goes into the small hatch on top of the fuel tank. The hose goes back to a very large diesel storage tank on the farm. We filled both the propulsion and Hurricane tanks before crossing the canal and mooring opposite. Today the 175A alternator has performed without a fault. But we’re keeping a close watch on it. We don't know who was first! I wonder if anyone yells across that they follow,the blog!! No us..... We recognized it wasn't you!